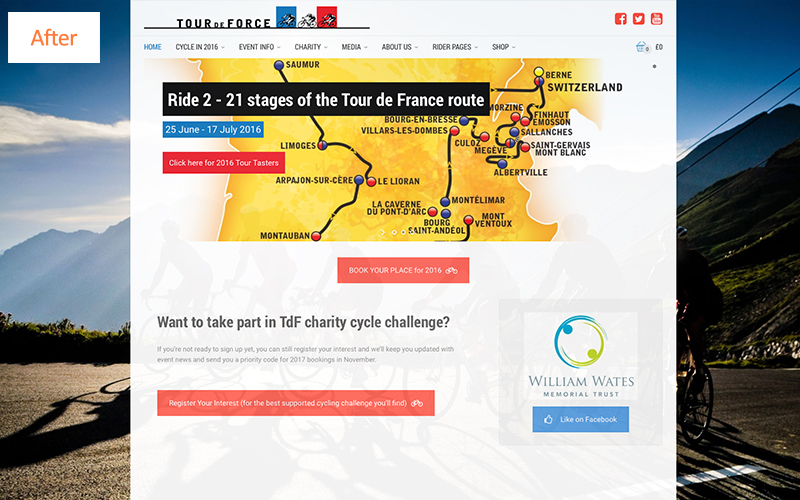 Tour de Force is a not-for-profit organisation that runs a huge cycling event to follow the Tour de France route each year, raising money for the William Wates Memorial Trust. 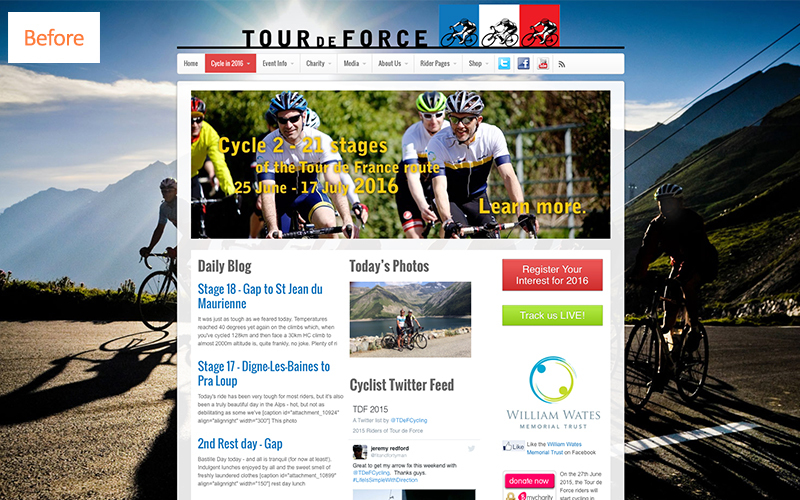 We’ve been working with Tour de Force since early 2013 when they enquired about hosting and maintenance. Since then we’ve worked with them to evolve the website a little more each year, to make it work harder and reduce the admin the team had to do. Then in the summer of 2015 we worked with them to launch a brand new, responsive website. 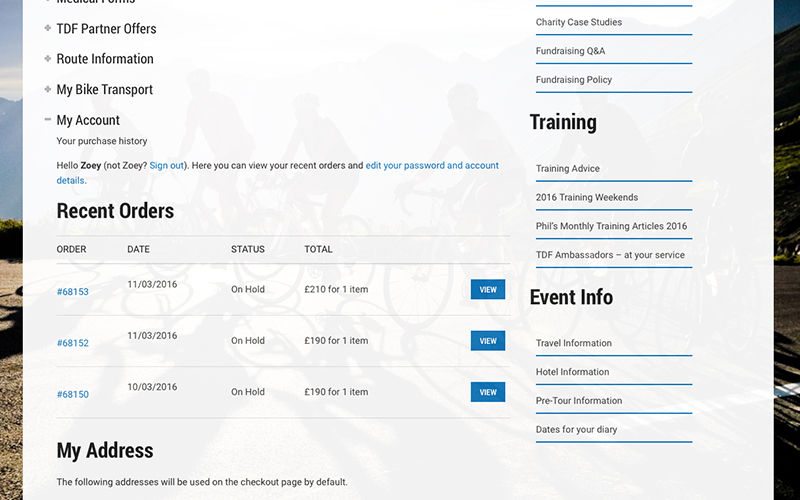 When TDF originally came to us they needed support with WordPress and their existing system, which could take online payments and rider details, and had a workflow function so they could see where each rider was in the process of making their payments. It had worked well for them, but was sometimes slow and involved a lot of manual tasks which were often time consuming, particularly during their busy ‘sales days’ and the event itself. Over time we’ve evolved what they had and eventually replaced it with a new system and responsive website. For this project, since we were ‘mimicking’ the existing site whilst bringing it up to date, we went straight into development. 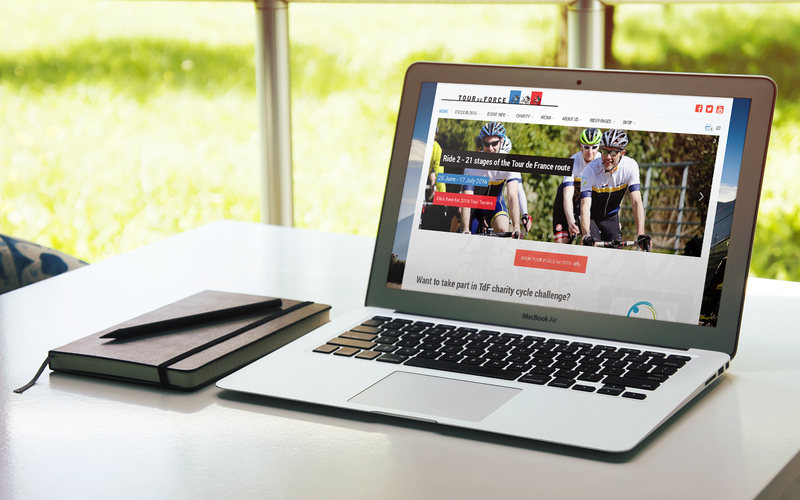 First we took a carbon copy of the existing site, with all their settings, data and content, and installed it on our test server, then made the design updates there for TDF to review. They came back to us with some minor changes which we implemented and then turned our attention to the functionality. 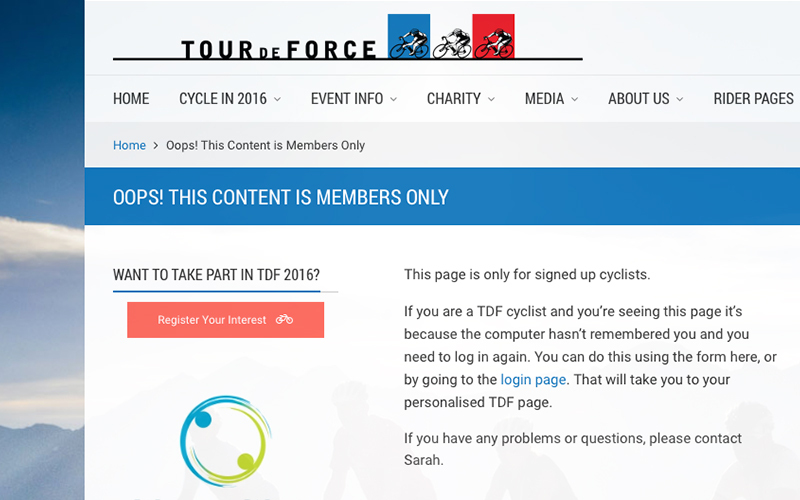 TDF wanted to streamline the process for signing up to the event. They have several ‘tours’ or packages available and participants have to sign up quickly to get a place. They then have subsequent payments that have to be made at key times, and documents that riders must provide in order to take part. In previous years a great deal of this was done manually. giving them access to new information. One of the most pain-staking tasks for TDF in past years had been collecting medical forms from riders – something that had to be done via a spreadsheet and manual emailing. 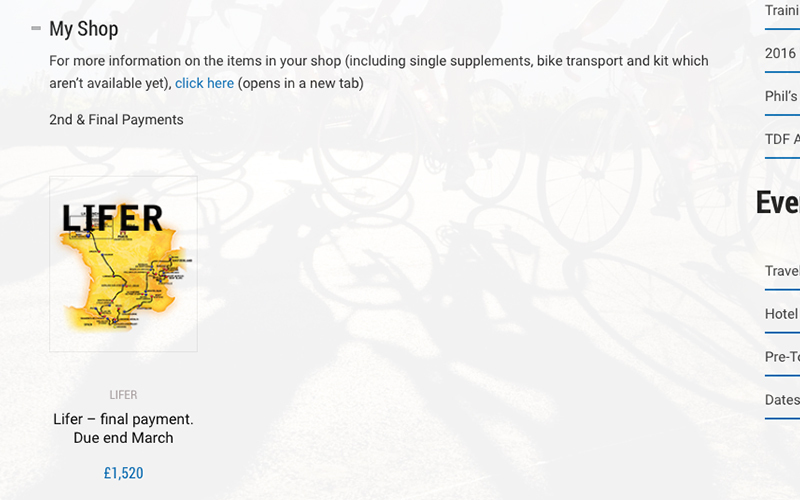 This information is now part of the rider’s account and can be exported if needed, so TDF can bulk email riders directly. Riders can then log in, fill the form in online and print it ready for their doctor to sign. A scanned copy can then be uploaded and sent directly to TDF. All this has saved them a huge amount of time and admin – in fact, they reckon that since the new site when live they’ve saved around 2 working days each month – more during their busy periods. Once the functionality was in place, we did lots of testing together with TDF, to make sure that everything worked as anticipated, and then launched in time for their big sales day. We launched the site on an upgraded server to ensure top performance during their busy period. We regularly speak to the team at TDF, providing support and extra development whenever it’s needed, and doing our best to find ways to incorporate their ideas for continual improvement. For example, following the launch they thought it could be useful to allow people to join a waiting list for places on the tour, so that in the event of a cancellation they have a list of people that could fill the place. We added that functionality within a few days and are told that so far it’s proved very useful! “We wanted our website to be more efficient in handling our event admin, and this is exactly what we got. All the improvements have been spot on, and I’m amazed at how quickly and easily SOTO understood our needs and made it happen – without huge expense. They are brilliant developers and I had no idea it could be so painless. The thing that most attracted me to SOTO during my search for a new web developer was the ease of communication. Zoey listens really well and I’m often amazed by how quickly she grasps not just our website questions but also the business behind it. This communication is the thing I value most. I’ve never found anyone else who enjoys speaking to their web developer as much as we do and I recommend SOTO very regularly to other businesses. Since working with SOTO, I’ve never been frustrated by empty promises or over enthusiastic quotes or time frames. Everything is as it should be and often better. We work together, discuss problems, decide on solutions and it’s all easy and straightforward.